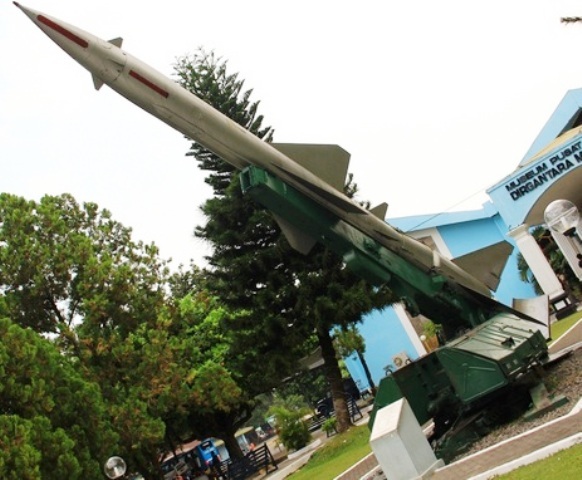 Located just behind the Adisucipto International Airport, Yogyakarta’s main airport, the Aircraft Museum goes by the name Museum Dirgantara. It is well maintained and its exhibits are surprisingly good, but the museum is overshadowed by the city’s more cultural museums. Despite the limited budget, the aircrafts are well maintained and are in good condition. The vintage World War II aircrafts on exhibit and under the curator’s care include a Sikorsky UH34D, MIG15, MIG17, MIG19, MIG21, MI4, TU-16 Badger Bomber with air-to-ground missiles, Mitsubishi Army type 98, Grumman Flying Boat, Catalina Flying Boat, Auster MkII, Lavochkin LA-11, PZL-104 Wilga, Nakajima KI43 Oscar, Zero, Mustang, NA16/AT-6, Vultee Valiant, B25, B26, C47, Hillier 360, DH114 Vampire, Boeing Stearman, CAC F-86 Avon Sabre, L-29 Dolphin, A4 Skyhawk and T-33A. Yogyakarta is one of Indonesia’s oldest cities and was Indonesia’s capital after the country finally won its independence in 1945 after the Japanese retreated. It is also the home of a number of ancient buildings and temples including the Borobudur and Prambanan temples, Indonesia’s largest Buddhist and Hindu temples, respectively. With so much history and culture, it is no wonder that there are so many temples in Yogyakarta. The Aircraft Museum is one of the least known. The most popular ones are the Museum Sonobudoyo on the northern side of the city’s main square and the Sultan’s Carriage Museum within the Kraton complex, near the entrance to the Kraton Palace Also known as Museum Kareta Kraton, Sultan’s Carriage Museum showcases 23 extravagantly designed chariots and carriages imported from the Netherlands and was used by Sri Sultan Hamengkubuwono VII from 1877 to 1921. The most popular carriage is the Kareta Garudo Yeksa, which is more commonly referred to as the “Golden Carriage” for its small 18-carat Garuda statue. Museum Kareta Kraton is open every day except Sunday from 8:00 AM to 2:00 PM, but only until 12:00 noon on Fridays. Meanwhile, Museum Sono Budoyo features unique Indonesian artifacts and relics that include traditional masks (topeng), puppets (wayang kulit), and batik, to name a few. Sono Budoyo is open every day except Monday. Another very interesting and historically significant museum is Benteng Vredeburg Museum, which is a small Dutch fortress that was constructed in 1765. Its architecture is very compelling. Going back to Museum Dirgantara or the Aircraft Museum, it is open from Monday to Thursday at 08:00 AM to 1:00 PM, and Saturdays from 08:00 to 12:00 noon. Although this specialty museum does not have any archeological items on display, it is slowly receiving the due attention and recognition it deserves.